Did you share a first date in the balcony of the Coronado? Maybe even a first kiss? Did you spend your Saturdays as a kid watching movies at the Coronado? Have you been coming to the Coronado for years, but always wondered how it would feel to stand on stage? Now's your chance to tour Rockford's Crown Jewel, the Coronado Theatre! LOLTOS will offer Tours upon availability of the theater. Group tours cannot be scheduled more than 30 days in advance due to the active events at the theater. If you would like to schedule a tour, or be put on a waiting list for a group tour, please email LOLTOS at coronado.loltos@gmail.com and we will contact you with the next tour date. Tours include: The Grande Barton Theatre Organ played by a LOLTOS member, an atmospheric show, the organ chamber, Van Matre-Owners Art Deco Apartment circa 1927, Stars and Chorus Dressing Rooms, Stage area, audience chamber, and more. Tours last 2 hours. Please be prepared for a walking tour, albeit, we are Handicap Assessable. For tour, please arrive 15 minutes early. 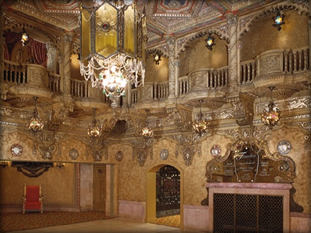 Private tours of all the 'nooks and crannies' of the Coronado Theatre are available. They must be scheduled in advance. The cost is $10 per person. There is a minimum of 10 people or $100 per tour required. Please e-mail coronado.loltos@gmail.com for more information or to schedule a tour. We are pleased to announce that LOLTOS will again resume the tradition of Halloween Tours for 2018. Dates and times to be announced at a later date. 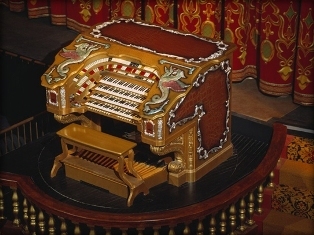 LOLTOS Saturday morning Organ Socials at the Coronado Theatre start promptly at 9:30 AM. Coffee and treats are supplied prior to the Organ concert from 10AM - 11AM with an open console afterwards for those who wish to play the organ under the guidance of their Organist. These programs feature lively and listenable popular music, much of it from the 1920s, '30s and '40s, when the theatre pipe organ RULED. We hope that many people throughout the Rockford area and beyond will come and hear a pipe organ replete with a large collection of real percussion instruments and special effects, much different from a concert of church organ. No cost and no reservations necessary (Donations welcome). Send an e-mail to coronado.loltos@gmail.com.